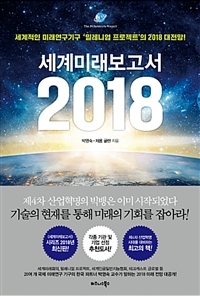 On 11th October 2018, an announcement came: The State of the Future 19.0(SOF) won a 2018 Association of Professional Futurists (APF) Most Significant Futures Work (MSFW) award in the “analysis of a significant future issue” category. “This significant future issue” is broken down into fifteen challenges that this review will touch on later. 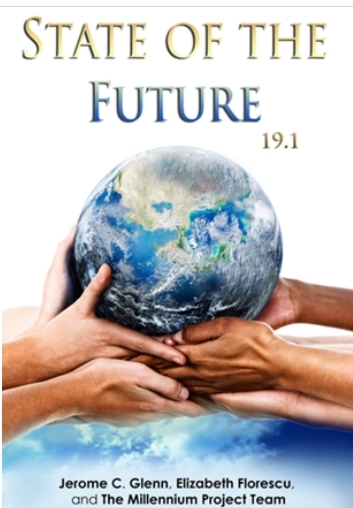 For now, it is important to know that version 19.1 is available, with a note stating that “the difference between this State of the Future 19.1 and version 19.0 is only the addition of info graphics for each of the 15 global challenges.” It is 227 substantive pages and nine additional ones of fore matter. How do the authors and their collaborators achieve this mark? By deploying appropriate tools. Utilizing global futures research studies, global scanning systems, an online Global Futures Intelligence System (GFIS), Real Time Delphi (RTD), TMP – through its network of 63 nodes and in consultation with a multitude of futurists and other experts ‒ identified and covered fifteen critical global challenges: sustainable development and climate change; water and sanitation; population and resources; democratization; global foresight and decision making; global convergence of ICT; the rich-poor gap; health Issues; education and learning; peace and conflict; status of women; transnational organized crime; energy; science and technology; and global ethics. The SOF book is littered with proposals on how to possibly address these challenges. The SOFI can be calculated for the globe, as in this State of the Future pacesetter book over the years; or at national level – as indeed has been done for some thirty countries since 1996. It can also be done focusing on organizations, corporates or individuals; or on a sector, an issue, characteristic variable, domain or sub-domain. The SOFI could be a springboard for scenarios crafting. An immediate good candidate for this is the issue highlighted in Chapter 4 of the book, namely The Future Work/Tech 2050. Global scenarios and strategies are suggested and, so far, eighteen countries have held national workshops to domesticate and operationalize such strategies; ten are in the planning stage; and another ten exploring to do so. This is the one Chapter in the book that is explicit on the time horizon for the challenge under discussion (a generation or more); the others are somewhat silent on this. Time matters because, the longer it is, the less the events’ controllability ‒ especially in these times of volatility, uncertainty, complexity and ambiguity (VUCA) and disruption. But this “oversight” about time frame is quite in order when there are multiple factors under consideration. In Economics, the distinction between the short run and the long run is simply the number of factors that can change during that period (the long run being when all can change), not a matter of how long it takes. It adds clarity of perspective, however, when time is invoked; like the book’s passing reference to the deep time history of global warming which occurred 253 million years ago. The book claims that “the challenges are interdependent [and that]arguing whether one is more important than another is like arguing that the human nervous system is more important than the respiratory system.” Not quite. Biological systems may be immutable, but human ones could ‒ to various degrees ‒ be subject to choice. In fact, with respect to the SOFI, the 29 variables have been allocated “their respective weights (importance to the system) … decided through RTD studies.” What is good for SOFI should be good for the fifteen challenges. Intra-challenges and inter-challenges, rankings and prioritization could be necessitated by budgetary, logistical and other constrains to scheduling and prioritization often called for at the implementation stage. While everything may depend on everything else, it is near impossible to do everything at once. Fortunately, it is possible ‒ by use of, say, cross-impact analysis ‒ to seek a manageable few that reinforce one another in the achievement of salutary objectives. The State of the Future is lucidly written, making it comprehensible to a whole range of readership. Liberal with literature and references, one is prompted to read further. So, this book is useful to the academic types, policy makers, business strategists and others interested in human-interest issues. The authors have done well to remind us to not be bogged down by short-termism of the here and now, but to also take care of the future where most of us will spend the rest of our lives. Leopold P. Mureithi is a Professor of Economics at the University of Nairobi. He can be contacted at Lpmureithi@hotmail.com.